Japanese mid 20th century bamboo flower basket. The basket is of round form with a natural branch handle at the top and natural branch added to the front and back. 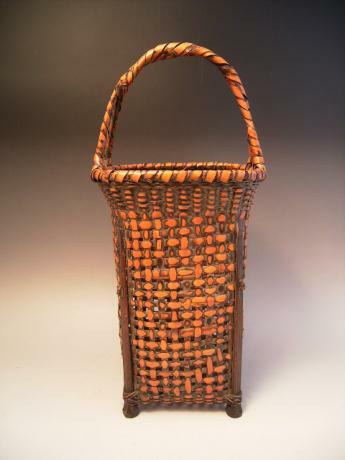 The basket is woven with medium strips of tan colored bamboo. Unsigned. 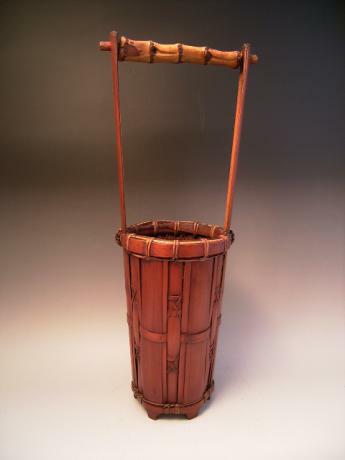 The basket measures 15" tall, 8 1/2" wide at the widest and 8"..
Japanese early 20th century bamboo flower basket. 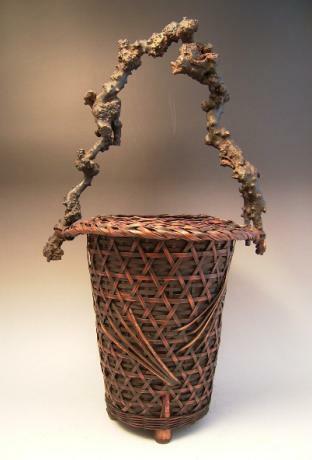 The basket is of squared cylindrical bucket form with double handle wrapped with medium strips of tan and dark brown colored bamboo. The basket is woven with medium strips of bamboo with whole bamboo stalks at the corners, forming the feet of the b..
Japanese early 20th century bamboo flower basket. The basket is of cylindrical bucket form with long handle of wide strips of bamboo. 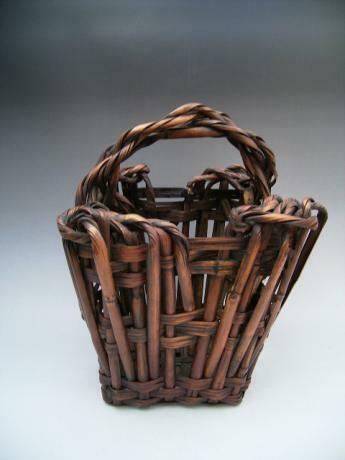 The basket is woven with fine, medium and wide strips of dark tan colored bamboo. Unsigned. The basket measures 20" tall, 6 1/2" wide and 5 1/2" deep. The base of t..
Japanese early 20th century bamboo flower basket. The basket is of tall cylindrical form with wooden branch handle. The basket is woven with medium and wide strips of dark bamboo. The basket measures 18 1/2" tall , 9" wide and 7 1/2" deep. The base of the basket is circular. 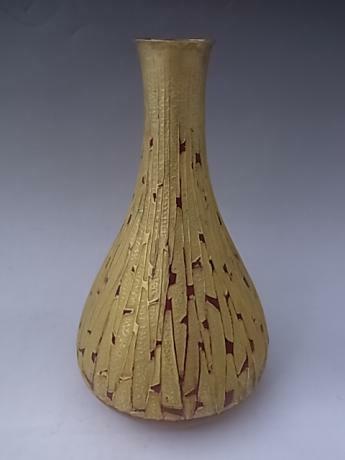 Japanese early 20th century bamboo flower basket. 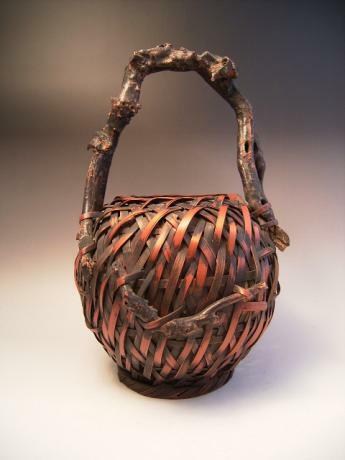 The basket is woven with fine and thin bamboo strips along with Mulberry root handle and bamboo feet. Unsigned. The basket measures 20" tall and 10" wide and 9" deep. The bottom is a circular shape. 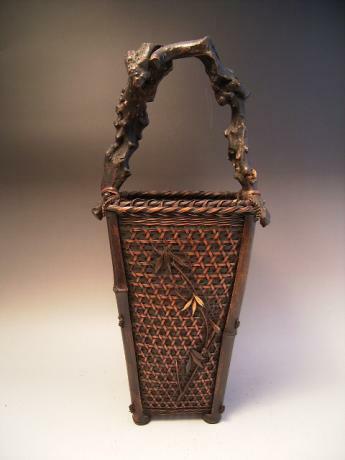 Japanese early 20th century bamboo flower basket. 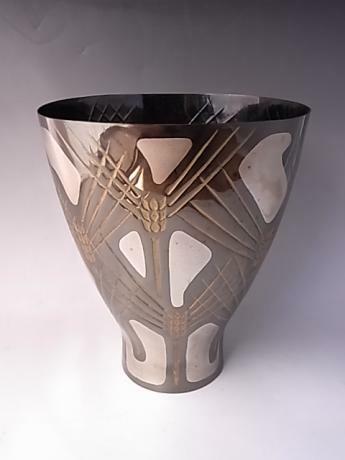 The basket is of large rectangular form with natural root handle. 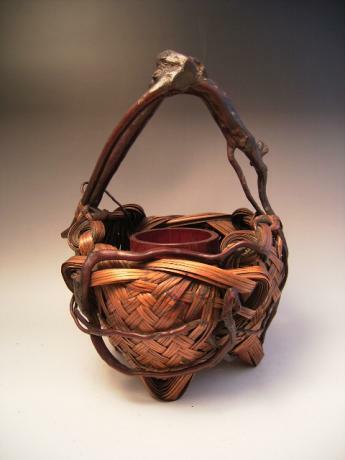 The basket is tightly woven with fine and extra fine sized strips of tan and dark colored bamboo. The front panel has the design of a small bamboo plant, with stalk, stems and leave..
Japanese early 20th century bamboo flower basket. The basket is of bucket shape with natural wisteria branch handle. The basket is woven with multiple layers of medium width strips of bamboo with the natural wisteria branches weaving in and out. Unsigned. 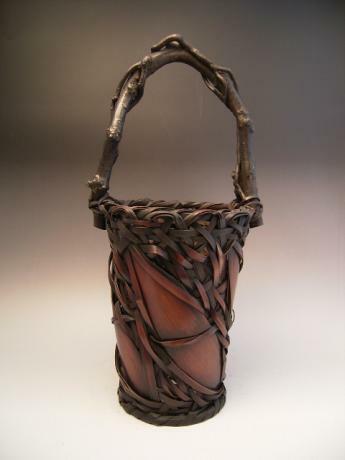 The basket measures 14" tall, 11" wide and..